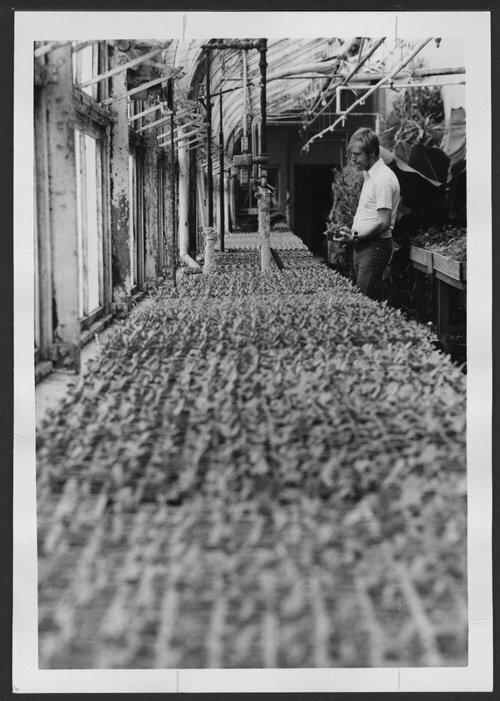 John Zimmerman of Plant Operations is inspecting some of the flower seedlings growing in the West Campus greenhouse. Planted in January, transplanted in February, they will be planted in the West Campus and Children's Division flower beds in May. The Menninger Clinic philosophy of treatment was the bio-psycho-social approach. This philosophy of treatment integrated medical, psychodynamic, developmental, and family systems to treat the total health of patients. The milieu of a pleasing campus with colorful flowers added to the treatment surroundings.